Prior to each implementation of our software solution, we will provide you with the best possible analysis of your situation on the spot. Our goal is to keep our system in line with your processes, your process flow, and not the other way around. A profound analysis most of the time shows that there are several options, from which the best choice can be implemented in consultation. 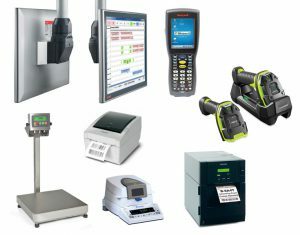 In many cases, this also results in making the right choice for the input and output hardware to be used for all the required data for an accurate traceability and quality control. Manual input is always an option, but usually not the most optimal option. We try to avoid human error as much as possible. As a result, for example, barcode scanners are used to register raw materials and/or intermediate products. Weights can be automatically read into the software using connected scales. A simple input of additional data can be realized in a production environment by using touchscreens, e.g. in combination with an industrial PC, depending on the degree of protection required (e.g. IP 65, IP66). Our solutions can also communicate with your machines via PLCs, etc. Of course, we support all your employees in implementing our solutions and provide the necessary training. After that, we can always be contacted for support and we will offer you a maintenance contract for software updates.